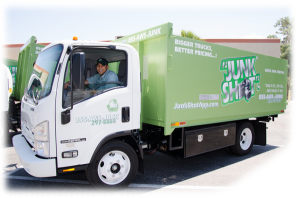 Whether downsizing or clearing out for new tenants, Junk Shot specializes in coordinating small and large Office / Warehouse clean-outs. The Junk Shot Team will map out and complete a pickup plan that will restore cleanliness and order to your office space. All you need to do, is point! We can remove nearly anything – office furniture, desks, chairs, and more – from anywhere. It’s as simple as pointing to the junk and watching it disappear. To make things more convenient, we offer a Free On-site Estimate at absolutely no obligation! The Junk Shot App Team offers same or next day Free Estimates, and we’re always ready to offer service immediately! Call 1-855-297-5865 Today, or fill out the Quick Online Form to the right.